Custom Made OEM Fit Seat Covers (SnakeSkin). Key Chains & Other. Fuel/ Heater/ Vacuum Hoses. 4 Lug Wheel Adapters. 4×114.3 (4×4.5). 4 To 5 Lug. 5 Lug Wheel Adapters. 5×114.3 (5×4.5). 5 To 6 Lug. 6 Lug Wheel Adapters. 6 To 8 Lug. 8 Lug Wheel Adapters. 8×6.5 (14×1.5). 8×6.5 (9/16-18). 8×6.5 To 8×170. 8×6.5 To 8×180. 8×170 To 8×6.5. 8×180 To 8×6.5. 8 To 10 Lug. Black Hub-Centric Wheel Adapters. Bulge Acorn Close Lugs. Bulge Acorn Open Lugs. Audi Hub Centric Wheel Spacers. 5×100 & 5×112 (57.1HB). 5×112 (66.6HB) New Models. Bmw Hub Centric Wheel Spacers. 5×120 (72.56 HB). 5×120 (74.1 HB). 5×120 (74.1 >72.56 HB). Mercedes Benz Hub Centric Wheel Spacers. Mercedes W/ OEM Wheels. Mercedes W/ Aftermarket Wheels. Mercedes W/ Other Mercedes Wheels. Porsche Hub Centric Wheel Spacers. 5×130 (71.6 HB). 14×1.5 Ball Seat. 12×1.5 Ball Seat. 14×1.5 Cone Seat. 14×1.25 Cone Seat. 12×1.5 Cone Seat. Porsche OEM Lug Bolts. Zip Ties (Cable Ties). 120 LB (Heavy Duty). 175 LB (Heavy Duty). 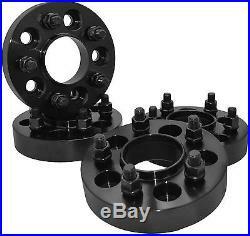 Brand New set of High Quality 4 Pc 1.5 (5×5) Jeep Black Aluminum Hub Centric Wheel Adapters. CNC Machined using Forged 6061 T6 Aerospace Aluminum. Hub Centric – means they will fit perfectly over your hub, and you wheel will have a lip to sit on too. Our adapters will not vibrate under any speed. We repeat ” Our adpters will not vibrate”. Adapters are designed to move the wheel further out from the hub. Fixes clearence issues, wheel hitting the brake calipers or shock/struts. Fixes wheels that look tucked in the fenders, Gives your car an aggressive stance. Perfect for lifted Jeeps. WE HAVE TESTED THESE SPACERS ON THE ROAD AND AGGRESSIVE OFF-ROAD. 5×4.5 (5×114.3mm). 1/2-20 Studs & Lug Nuts. Forged 6061 T6 Aerospace Aluminum. Grand Cherokee (All Models). Wrangler JK (All Models). We encourage our customers to take necessary measurements to ensure a proper fit before purchasing. We recommend getting these adapters installed by a trained professional, but it’s not necessary. The spline lug nuts are designed for all aftermarket wheels and some stock wheels. This kit includes 20 opened end lug nuts used to mount the adapters. Use your stock lugs to mount the wheels. Lug nuts on the adapters and wheels must be properly torqued down to your vehicles specifications. Vehicle studs cannot stick out pass the face of the adapter. If it does, you may need to grind them shorter. (Only applies to 1 adapter or smaller). Best prices on the market. We stand behind our product any day. We use and test our own products. Excellent & friendly customer service. We take this serious! Rest assure you will receive exactly what is described above. I promise you will receive exactly what is stated above, nothing less. We are here to help. To All 50 States. It is only fair. CAN’T FIND YOUR ANSWER? Will this kit fit my vehicle? If your vehicle is listed above on our compatability, then the answer is Yes. What other sizes are available? 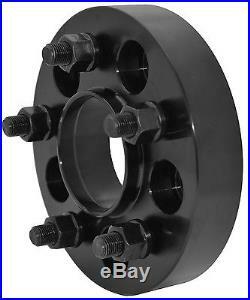 We carry a large variety of hub centric wheel adapters for Jeeps. From 1″ up to 3″ in black. We aslo carry the conversion; 5×4.5 to 5×5. Allows you put new models wheels on older jeeps. Is these wheel adapter kit safe? Yes but they must be installed properly. Not difficult to install. Make sure you propely torque the lug nuts to manufacture specs. We have off road tested these wheel adapters with no issues. How long before I receive my items? We stock hundreds of kits all the time. 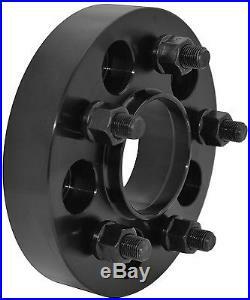 The item “4 Pc Jeep Wrangler 2007-2015 Black 1.5 Thick Hub Centric Wheel Spacers Adapters” is in sale since Monday, July 13, 2015. 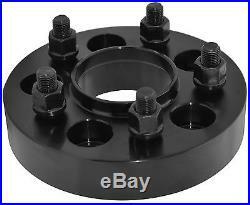 This item is in the category “eBay Motors\Parts & Accessories\Car & Truck Parts\Wheels, Tires & Parts\Wheel Lugs”. The seller is “rdcobra91″ and is located in Lynwood, California. This item can be shipped worldwide.